MSR Trail Base Water Filter Kit. 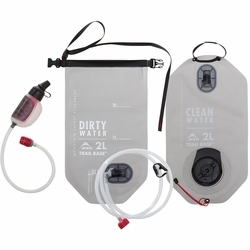 Ultra-versatile system that offers gravity filtration at camp + a small filter for the trail. Complete Kit: Includes ultralight, durable clean water reservoir, which features MSR's 3-in-1 cap for easy filling, drinking and pouring.